First, we’ll come out to see if you just need a tune-up. Regular maintenance is crucial to keep your commercial hot water heater functioning at its optimum level. If we decide together that you do need a new model, we’ll talk through the many choices available to find the right one for your needs. There are many options and many factors that we will take into consideration. First, it depends on the size of your building, the number of fixtures and how often and for how long hot water is needed. Also, we’ll take into account whether hot water is a necessity to run your business, as in a restaurant, gym or hotel, for example. Many businesses require a commercial hot water heater that regularly puts out a large capacity of water and we will assess all your needs. The size you choose is crucial, to ensure that your business can run with a steady supply of hot water, and to make sure that it is energy-efficient so as to help keep your water bills in check. 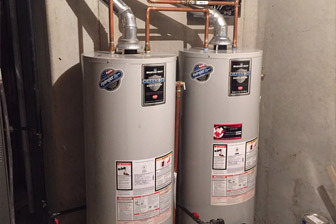 Our trained technicians at Beaverton Plumbing will guide you through the pros and cons of the various typesand sizes of commercial hot water heaters that you might want to consider, such as traditional tank water heaters, tankless water heaters, solar water heaters, and heat pump water heaters. Then the Beaverton Plumbing experts will help you explore the features and benefits of all the options so you can choose the one that fits your business’ unique needs and yet can accommodate your budget. Finally, we’ll make sure the installation is both speedy and correctso that there is no lapse in service for your commercial hot water heater. Of course we will create a maintenance plan that will protect your investment and you and your tenants’ business needs by keeping your water heater functioning smoothly for years to come.